You know how I mentioned (here) that the online import game shop wolfgames.com is having a going-out-of-business sale? Well, shortly after I published that post I ordered a few heavily discounted games from said store. Among the games I ordered: The PC Engine CD version of Wonder Boy III: Monster Lair (aka Monster Lair in the States). While flipping through the game's manual a few minutes ago (my order arrived earlier today), a small piece of paper slipped out of it and fell onto the floor. I can't read a word of Japanese, so I have no idea what the note says. That hasn't stopped me from obsessing about it, of course. Was the author of this note a previous owner of the game? Did he or she like it, or hate it? Is he or she warning me that this copy of Wonder Boy III is cursed? Those are the kinds of questions that are going through my head at the moment. SWEEEEEEEET! That's some of my favorite stuff to find! But...if I couldn't read it, I'd be going crazy, too. Find someone to translate. LOL, do you really want me to spoil the mystery for you? If so, read on. If not, ignore the rest of this post. OK, its basically just a cheat code for how to continue after a game over. 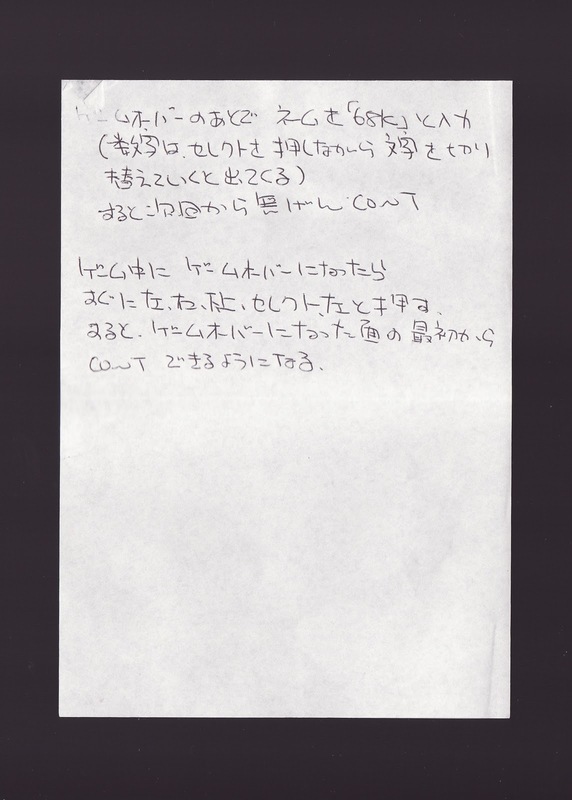 Its hard to read the handwriting, but the first paragraph says to enter 68k (I think) as the name, then after "game over" press "select" down and enter the number, after which (something I can't read) will appear and you can continue. The second paragraph says "During the game, when you reach "game over" quickly hit left, right, down, up, select, left and you will be able to begin over again from the game over screen." Sean: Thank you! I have admit, someone spilled the beans on my other blog earlier today, although not to the extent that you did. Justin: I know! I rarely find stuff like this, but I'm definitely happy when I do. Still fun, regardless. I'm glad the mystery is solved!